Most effective solution to keep your dog dirt- and soak-free in rain or snow. You may find the idea of dog boots to be silly, but your dog may actually need them. Good waterproof dog boots can protect your dog from extreme temperatures, weather and rough terrain. And the best waterproof boots for dogs are the perfect protection for dogs walking through rain or snow. Now, the first question you'll consider is whether your dog really needs boots. The answer to that will depend on your pet. But paw protection isn't the only reason dogs need footwear. Guarding dog's paws is essential, and even more so for senior dogs. As dogs age, their muscles weaken. Very often, it may benefit senior dogs to wear dog shoes with grip on the bottom or some type of paw protection, e.g. dog socks or paw protection wax. This prevents sliding when outdoors or inside on hard flooring. The best waterproof boots for dogs will also be a necessity if your dog gets a paw injury. Stepping in water, dirt or walking on unclean floors exposes your dog to further issues and inflammation if there's an open paw wound. It could invite germs and cause infection. * Click on the waterproof dog boots brand for more information and prices, or scroll below for more details. 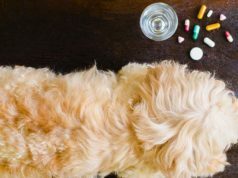 We have previously written about the major health benefits that majority of dog shoes provide for dogs and their owners. You can read the article on 19 Health Tips for Choosing Dog Footwear here. Ultimately, if you're looking to learn what the best waterproof dog boots are, you probably already have a reason to get a set for your puppy or dog. Usually, if your pup is very active outdoors on a regular basis, regular dog boots that stay on can be beneficial. Dogs that hike, walk on rough terrain or spend a lot of time outside in extremely hot or cold temperatures need their paws protected. For owners in rainy or snowy parts of the country, best waterproof boots for dogs would be ideal. When choosing footwear for a dog, measuring your pet's paws is essential. Not all dog paws are shaped the same and certainly not all dog booties will fit. Sadly, you can't always trust what is written on the product packaging or Amazon listing either. Just because a pair of boots says it will fit a Chihuahua doesn't mean they actually will. Dog boots come in all different sizes and styles, and it's important to find a set that will fit properly and be comfortable for your dog. It's also vital to find dog booties that stay on while walking, and that's not all of them. Below, we picked the best quality ones. All you have to remember is measure your dog's paws and pick the right size of dog shoes. Dogs need feet protection in their active lifestyle. For indoor protection, socks will suffice; but for the outdoors, sturdy shoes, like these from My Busy Dog, are necessary to protect against harsh elements and sharp objects. These best waterproof boots for dogs have some amazing features. For starters, they are made from high-quality fabric and have a durable anti-slip rubber bottom for stability and traction. These dog boots are water resistant to keep paws dry and warm. The sizes range from 1 to 8 and colors are available in black, red, green, and orange. Dog owners who’ve bought these shoes say that their pets are several steps ahead of other dogs because of the convenience, protection, and user-friendliness of this footwear. The wide- opening is fixed with two adjustable Velcro straps to customize fit. Pet owners love that My Busy Dog Waterproof Dog Shoes are easy to pull on and off, and that they are equipped with reflectors for better visibility. Buyers are also thrilled that their dogs took easily to the shoes. It’s also a great bonus that they now do less of the tedious paw-washing chore or the back-breaking job of cleaning off paw-marked floor. These boots are a bit pricey, but owners say they’re worth every dollar spent – the product has lived up to their expectations. One reviewer was disappointed, claiming that the boots only lasted 2 weeks before they ripped. As with any of the best waterproof boots for dogs, you'll also find a few reviews from buyers who were happy with the quality of the boots but were not happy with the fit. These all-weather dog boots by Bark Brite are fashioned from high-quality neoprene which makes for a tight Spandex-like fit. Get your dog looking cool and fashionable, and keep his paws dry and warm at the same time. These doggy boots are well-made and durable – the perfect protection against unforgiving environments, sharp or hard objects, and hot surfaces. The outer sole is tough with high-grip, while the inner lining is soft and comfy. This footwear is outfitted with two reflective Velcro straps. Pet owners learned that this thing works much like a hand glove – it expands. The sizes recommended in the guide are based on paw length and full-rounded width, and will ensure a really snug fit that conforms to the paw shape. If your pooch requires a looser fit, get the next larger size. There are 5 sizes available ranging from small to XXL. Buyers approve of the boots’ construction and stitching. While the material is durable neoprene, it cannot be expected to ward off puncture from really sharp objects. It’s easy to see how dogs romp more easily in Bark Brite All Weather Neoprene Paw Protector Dog Boots flexible boots than in the more rigid types. Since they’re very comfortable, dogs can wear them longer without hurting their paws. Many negative reviews come from pet owners who purchased these boots for hiking and other outdoor activities. They say they don't hold up well to rough terrain. Other negative reviews say these boots aren't suitable for large breeds. Large breed dogs usually become lethargic as they grow older, and having to move around barefoot can take its toll on their weary feet. This fairly-priced sturdy dog boots from Petacc could be just what you’re looking for. These doggy boots have all the basic qualities for indoor and outdoor protection: a solid water-resistant upper material to complement a tough and flexible sole, with interior lining that keeps paws secure and warm. They are easy to put on and off, but fasten securely with 2 adjustable reflective Velcro straps. These dog boots come in five sizes from 4 (2.5” x 1.9”) for dogs weighing 30-42 pounds up to 8 (3.3” x 2.9”) for dogs weighing 74-88 pounds. They look stylish in black with embroidered yellow paw design. 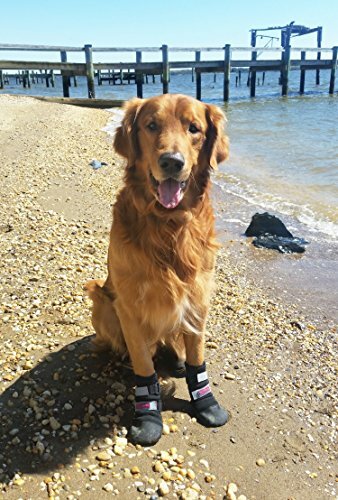 Dog owners found Petacc Dog Boots Waterproof Dog Shoes for Large Dogs to be perfect for snowy winters, because they kept the dogs’ feet warm, dry, and safe from snow and salts. Because of the better grip afforded by these boots, dogs avoid accidents due to slippery surface or sharp objects. These boots proved perfect for dogs that were forced to be less active due to an ailment or advanced age. Owners say they walk more comfortably, even on hard and hot asphalt or on rough or gravelly road. Some buyers did complain about the quality of the boots, though. Saying the seems come apart after just a few wears. Dogs that deal with mud, snow or water in their regular walk will need boots that are higher than usual. These best waterproof boots for dogs from Megipet provide protection for the dog from the paws to higher up around the hock for the hind legs and higher than the wrist on the forelegs. They come in four sizes from small (2.8” long/2.4” wide) to XL (4.7” long/3.5”wide). Designed to protect paws and upper limbs, these boots are made of tough waterproof oxford material, reinforced with non-skid natural rubber sole and wool-lined in the inside to keep pets secure, warm and comfortable. Two reflective adjustable Velcro straps (one placed high and the other low) on each shoe ensure visibility at night and a snug fit. Looks would be for nothing without functionality, so dog owners are happy that Megipet All Weather Dog Shoes are stylish but more important, that they work as expected. They claim these boots could wade through deep snow and remain dry and warm inside. Other boots would have only protected the paws, but these did that plus cover way up to the upper limb of the dog. To get the full benefit of this product, it is very important to get the right size for your dog. Some unsatisfied buyers admired the design, make and material of the boots, but due to some errors in sizing, their dogs were not able to benefit from everything that the boots offered. You'll also want to measure carefully, because some buyers were disappointed that these boots did not go as high up on the leg as they anticipated. 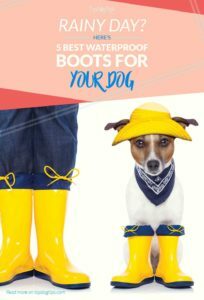 Hiware’s Waterproof Dog Boots are the cheapest on our list; and with their quality, we simply cannot allow them not to be on our list of the best waterproof boots for dogs. These are lightweight boots with heavyweight features. They are durably crafted from waterproof oxford fabric with a soft inner lining to keep dog paws warm and comfortable. The flexible non-skid rubber sole provides protection against snow, ice, and salt, while the polyester mesh sides add ventilation. The opening is made of stretchy ribbed material that makes taking on and off easy. Two Velcro straps secure the boots in place. Hiware dog boots are priced reasonably, that’s why many pet owners love and recommend them. With this affordability comes uncompromised quality. These boots were relatively easy for the dogs to get accustomed to possibly because of their simplicity and their relaxed style and make. Thick fleecy material adds comfort to the paws and dogs couldn’t like Hiware Waterproof Dog Boots for Large Dogs better. It must be noted that when taking the dog’s size this cushiony material takes up space inside the shoe and a few millimeters must be considered. Some long-time costumers say that the quality of these boots have changed in the last year. They claim they are not as well made now as they used to be. Pet owners that purchased these boots also say the Velcro straps don't fit tightly around the legs of smaller dogs.